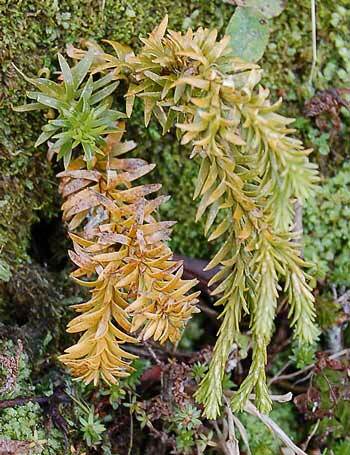 Variable club moss (Huperzia varia) is a common lycophyte of forest and upland scrub. It often grows as an epiphyte, dangling from perching lilies, themselves epiphytic on forest trees. The plant has spreading leaves when young, but develops tiny scale leaves as it matures. This small, tufted specimen was growing on the ground in a mat of liverworts and mosses.